Around the world, Airbnb has properties ranging from treehouses and small huts in Indonesia to mansions in England. As the company grows, it’s likely that the selection will continue to widen, both in variety of accommodations available and locations in which they can be found. As seen in Barcelona’s Airbnbs, this is occurring more rapidly than many people expected. 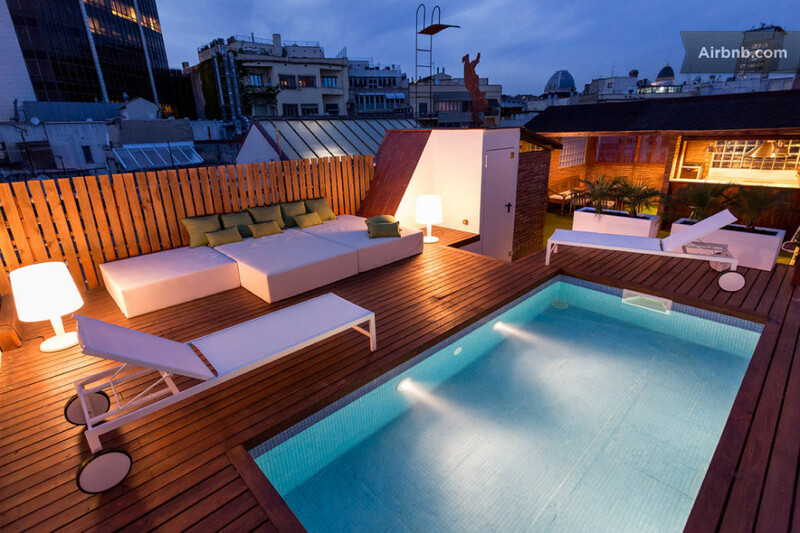 Now check out nine of our favorite Airbnbs in Catalonia’s capital. When the listing reads “Property type: Castle”, your eyes might widen. Just a little though – until you see the pictures. 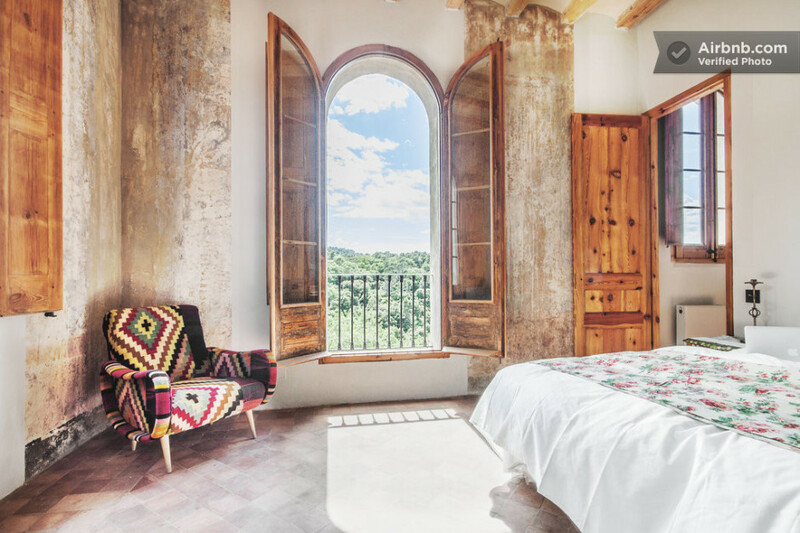 With 12 bedrooms and 30 beds, this villa located in Serra de Collserola Natural Park is the optimal accommodation for a (very) large group traveling through Spain. Or someone who likes a lot of space – 150 hectares worth. Sleeping over 30 people, the Valldaura castle even includes a restaurant in its space. With a pool, 2 massive patios, and a terrace, it’s not such a bad place to have a wedding, either. 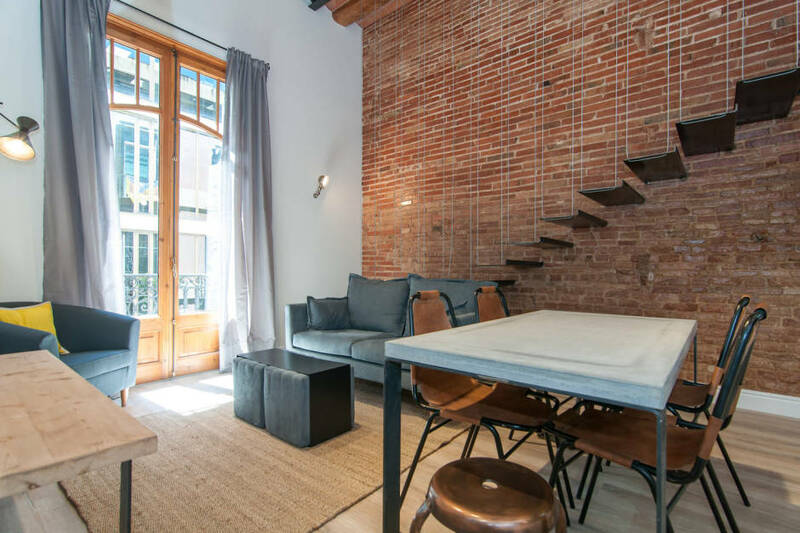 Found on Calle Balmes, not far from Rambla de Catalunya, this 300-square-meter duplex contains four bedrooms, three bedrooms, and two kitchens. Why two? Well, one happens to be poolside on the rooftop terrace, ideal for lunch or dinner after going for a swim in the middle of the city. With a modern interior clad in contrasting colors, the apartment makes for an impressive escape from the city’s hustle and bustle without having to leave the city. Imagine that. Renovated in 2012, the building in which this apartment sits actually dates back to the 1850s. The 160-year-old ceilings, woodwork, and mosaics remain. Sitting in El Born, the apartment makes effective use of both artificial and natural light in combination with bright colors and numerous tones of wood to create a bright atmosphere. 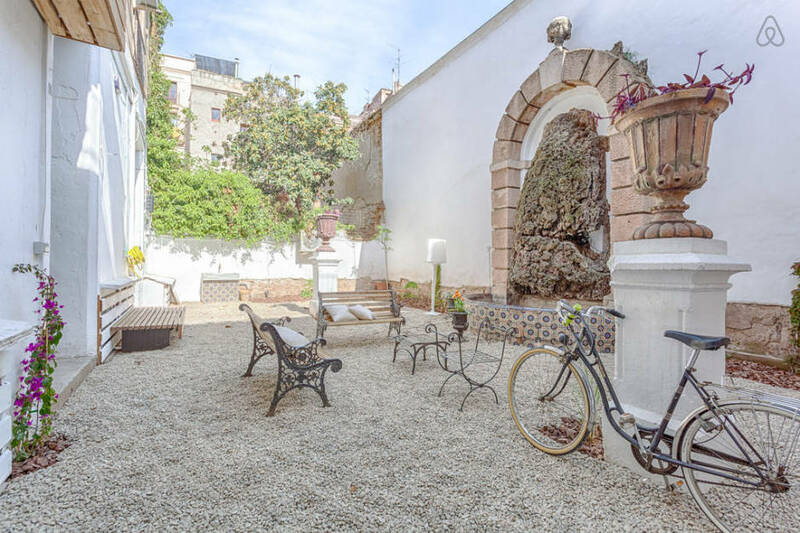 Not far from the famous Santa Maria del Mar and the Plaza Santa Maria, the apartment is in a prime location for evening strolls through the street. Located on the grounds of an 18th century palace, this apartment’s garden is home to a neoclassical fountain and several benches from which visitors can enjoy the constant sunlight. The eclectic interior, melding modern touches with the old mosaic floors, wooden beams, and frescos, is nothing short of impressive. With an open floor plan, visitors can cook and entertain guests at the same time. Just minutes from several of the city’s main attractions, the complimentary use of two bicycles might turn out to be quite beneficial. Typically, when one uses the word unique, it’s a sort of exaggeration. With this apartment, well, not so much. Utilizing an interesting layout and architecture, the accommodations are sure to keep guests’ eyes wandering at all times. The loft’s “open” floor plan is unlike the typical open floor plans seen in the majority of apartments. The same can be said for the bathroom, which utilizes a large open space and contains a “big walk-in rainforest style shower room.” Staying for a while? A bottle of cava or wine might just be included. Not far from the Plaça de Catalunya, this spacious apartment wouldn’t be out of place on a popular Instagram page or design blog (just look at the dining table and its backdrop if you’re unsure). Located in a Guadi-Modernist building in Eixample that dates back to the 19th century, many of old Barcelona’s features can be seen in the apartment. 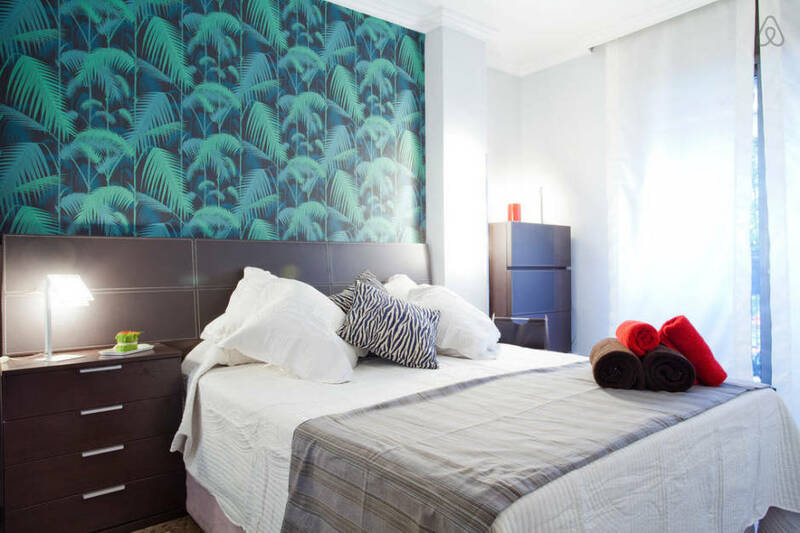 Recently renovated, the apartment gives off a clean, bright vibe that visitors are sure to enjoy. And a complimentary bottle of Spanish wine? Good thing so many attractions can be reached by walking. At first glance, this apartment appears to be well kept but plain (and the listing doesn’t state otherwise) – but the devil is in the details. The staircase in the 3-bedroom apartment appears to be suspended by thin metal bars, likely giving many a height-hating guest vertigo over time. With industrial lighting, “hidden” rooms, and several walls with textural patterns, the apartment teaches a lesson in subtlety. And in case you weren’t able to swing that cruise vacation that one year, you might find towel swans in the bedroom if you’re lucky. Between the art on the walls, backdrops, furniture, and plants, calling this apartment colorful is nothing short of an understatement. Not too far from the metro or bus stop, the apartment is a short walk from several restaurant and shopping options if you don’t feel like making a journey anywhere. The apartment contains 4 bedrooms and 2 bathrooms, making it ideal for a big group. Just don’t throw any parties or make too much commotion after 11pm! 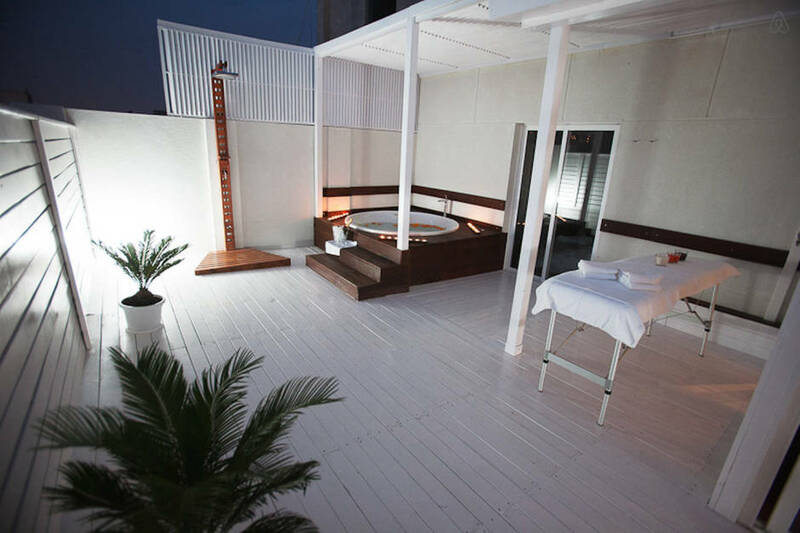 This apartment contains several terraces, making it difficult for you to decide whether you want to lounge in the sun all day with a drink in hand, relax on the massage table (massage therapist not included), or kick back in the hot tub. 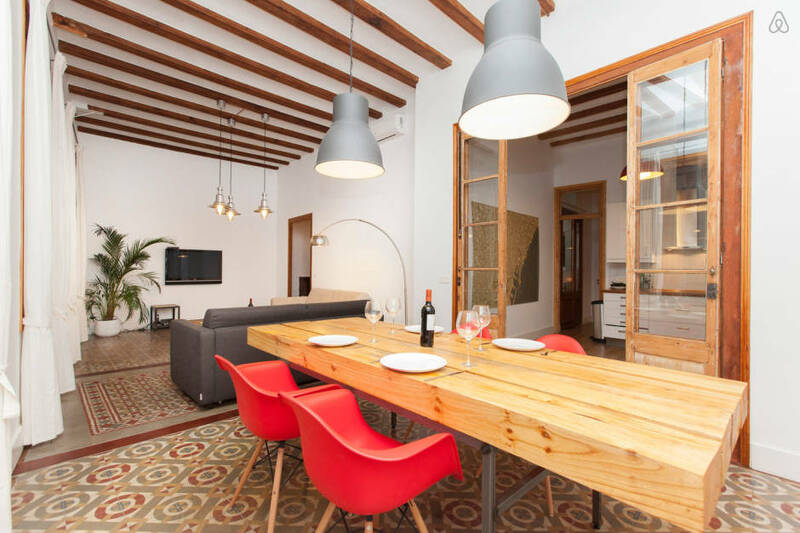 Not far from the Gothic Quarter, the well-lit apartment isn’t far from Gaudi’s famous buildings, Casa Milà (also known as La Pedrera) and Casa Batllo. Both are great places to visit, if you ever decide to leave.